Welcome to the Archives of First Presbyterian Church! The Archives section is located on the Third Floor of the Case Building, occupying six rooms on the south side of the hall. Anyone is welcome to visit on Wednesdays, between 9:00 a.m. and noon. Special tours may be arranged with the Archivist. The Archives at First Presbyterian Church came into being in 1970 at the time of the 100th Anniversary of the chartering of the church. Many church members contributed memorabilia for various displays. After the celebration was over, they decided to leave the artifacts with the church. At that time, the Archives was established and organized under the leadership of Gail Carpenter. Upon Mr. Carpenter’s retirement, Al Witherspoon succeeded him. He served as Archivist until his death in 2002. His successor was Gary M. Huffman, who is the current Archivist. The Archivist is assisted by several volunteers who come in weekly to keep up various aspects of the collection and is also supported by an Archives Board which assists as needed. 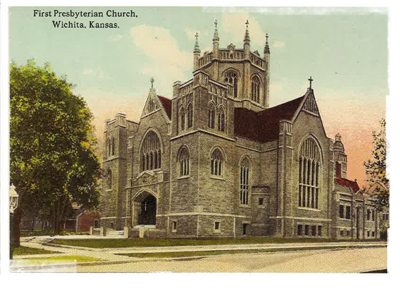 More information and building photographs can be found in the Wichita Business Journal, which ran the feature, "My Favorite Building: First Presbyterian Church 'lifts one upward.'"